Legendary Motorcar's December promo is on until December 31st! LMC's Year End Promotion Has Begun! 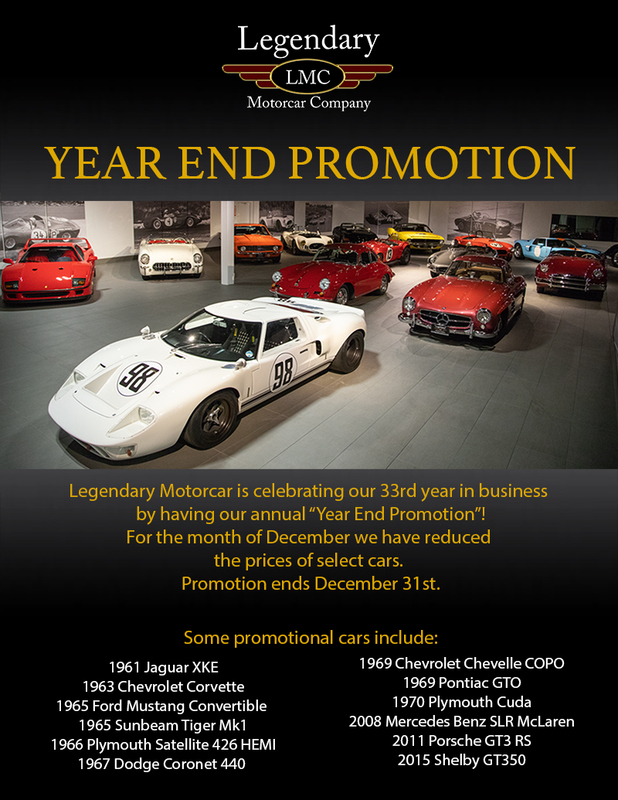 Legendary Motorcar is celebrating our 31st year in business by having our annual Year End Promotion! For the whole month December, we have reduced prices on select cars for purchases completed before December 31st! Head over to our cars for sale page to view our full list of discounted cars. The car was designed by American designer Tom Tjaarda and replaced the De Tomaso Mangusta. Unlike the Mangusta, which employed a steel backbone chassis, the Pantera was a steel monocoque design, the first instance of De Tomaso using this construction technique. The Pantera logo included a version of Argentina’s flag turned on its side with a T-shaped symbol that was the brand used by De Tomaso’s Argentinian cattle ranching ancestors. The car made its public debut in Modena in March 1970 and was presented at the 1970 New York Motor Show a few weeks later. Approximately a year later the first production Panteras were sold, and production was increased to three per day. The first 1971 Panteras were powered by a Ford 351 cu in (5.8 L) V8 engine that produced a severely underrated 330 hp (246 kW; 335 PS). Stock dynos over the years proved that power was more along the lines of about 380 hp (283 kW; 385 PS). The high torque provided by the Ford engine reduced the need for excessive gear changing at low speeds: this made the car much less demanding to drive in urban conditions than many of the locally built competitor products. Several modifications were made for the 1972 model year Panteras. A new 4 Bolt Main Cleveland Engine, also 351 cu in, was used with lower compression ratio (from 11:1 to 8.6:1, chiefly to meet US emissions standards and run on lower octane standard fuel) but with more aggressive camshaft timing (in an effort to reclaim some of the power lost through the reduction in compression). Many other engine changes were made, including the use of a factory exhaust header. The Pantera offered here is 1 of only 88 factory Green ones built as verified by the Marti Report. The car was restored to drive, use and enjoy. It has a rebuilt 351 Cleveland with an electronic ignition, a custom exhaust and updated cooling system including an aluminum radiator with electric fans and vents. Braking power has been improved with Wilwood calibers, aluminum hats and custom rotors. The suspension has updated control arms, bushings and sway bars along with an adjustable rear engine spreader bar. This rare Pantera has an outstanding appearance with gorgeous Green paint, a mint black interior and factory style updated 17” polished wheels on Michelin Pilot Sport tires. Included with the car is the Pantera Technical Information Binder, service and restoration invoices and the Marti Report.